MP Tiger Safari Tour | Call on +91-993.702-7574 for booking. Explore the major tourist attractions in Madhya Pradesh with Sand Pebbles’ special MP Tiger Safari Tour . Bordered by the majestic Vindhyachal Mountains, dense forests, mighty rivers and the Malwa Plateau, Madhya Pradesh is dotted with a large number of tourist attractions. MP Tiger Safari Tour is planned to let you explore Madhya Pradesh at its best. During this tour enjoy observing wildlife from close quarters at some of the finest wildlife sanctuaries. The state is popular for its innumerable historical monuments and the intricately designed temples of Khajuraho. 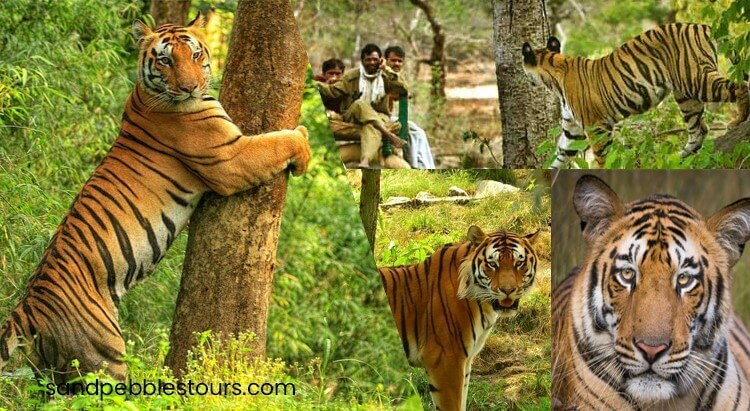 MP Tiger Safari Tour could be your perfect package if you love animals and wildlife. All over India, the density of Tiger population is highest known in Bandhavgarh National Park. Enjoy jeep/elephant safari to explore the park while visiting animals in their natural habitat. Book your MP Tiger Safari Tour now, to experience wildlife to the fullest. Arrival at Nagpur Airport / Railway Station, meet our representative, transfer to Pench National Park by Road, which is about 167 km away from Nagpur. Check in at the pre-booked Jungle Cottage. Overnight stay at Pench National Park. Best time to visit: The best time to visit the park is between November and May. The park is open to visitors between 6am-10: 30 am and 3pm-6pm. The Park remains closed during July, August and September. After breakfast with all natural surroundings now the time is set for Safari, enjoy First-morning jungle safari in the park and have a mesmerizing experience. Evening free at leisure. Later return back to the Cottage. Expect to see: There are approx 40 tigers in the park, 39 species of mammals,13 species of reptiles, 3 species of amphibians. Commonly seen Chital, Jackal, Nilgai, Sambar, Indian Leopard, sloth bear, wild dog, fox, striped hyena, four-horns dantelope and barking deer live in park. The park is rich in bird life too, the park harbours’ more than 210 species including several migratory ones. After breakfast check out the Hotel, depart for Kanha National Park by road, which is about 120 Kms away from Pench National park, check in at the pre-booked lodge and rest for some time. After lunch goes to the park for evening safari, then after enjoying safaris, we will return back to the lodge for a relaxing overnight stay at Kanha National Park. Expect to see: Tigers, Indian Gaur, Barasingha, Wild Dogs, Bears, it’s a Sal Tree Forest, so it’s green throughout the year. Pretty good chances of spotting a tiger in one of the grasslands. After breakfast with all natural surrounding now the time is set for Safari @ Kanha, enjoy First-morning jungle safari in the park and have a mesmerizing experience. Evening free at leisure. Later return back to the Cottage. Best time to visit: Best season to visit February to June, Visiting time in the park is 6:30am-12:00noon and 3:00pm-6: 00 pm and Park closed time is 1st July-15th October. After breakfast check out the hotel, then depart for Bandhavgarh National Park. Enjoy a delicious lunch served in the lodge and get ready for the evening safari in the park. This safari will give you an opportunity to see wilds in their natural possess and click as many as you wanted. Thereafter, we will return back to the lodge for dinner and an overnight stay at Bandhavgarh National Park, this is known for housing a large number of tigers. It was initially known as the hunting grounds of the Maharaja of Rewa. The park has today become a haven for wildlife enthusiasts. Expect to see: Tigers, Sloth Bears, Wild dogs. Chance of spotting a tiger in grasslands routeing to the fort. Best time to visit: All over year, pretty crowded around Oct-Dec. A visit to a 13th-century fort is not to be missed. After breakfast with all natural surrounding now the time is set for morning Safari @ Bandhavgarh, enjoy First-morning jungle safari in the park and have a mesmerizing experience. Evening free at leisure. Later return back to the Cottage. Overnight at Bandhavgarh. After BreakFast check out the hotel, and then depart for Panna National Park, Khajuraho by road, which is about 190 km away from Bandhavgarh National Park to add some more fun and excitement to our tour. Visit the park. Thereafter, we will return back, and then you can take an Ayurvedic massage in Ayur Arogyam and an overnight stay at Khajuraho. Expect to see: Among the animals found here are the tiger, leopard, chital, Nilgai, The park is home to more than 200 species of birds including the bar-headed goose, honey buzzard, King vulture etc… Land of mesmerizing waterfalls. Best time to visit: Basically all over the year, but best to visit between Oct-March. After breakfast, add on some more fun and excitement to our tour. On arrival enjoy a local sightseeing tour of Khajuraho. In our day tour, we will cover both the eastern group of Khajuraho and explore its ancient temples that are famous worldwide. It is one of the major pilgrim centres in India and comprises of two group i.e.eastern group and western group having many ancient temples. Overnight at Khajuraho. On the last day, Have breakfast in the morning and get transferred to the Airport to board the flight for your onward destination.